For more than a decade, development partners have been advocating the application of Information and Communication Technology (ICT) as a tool for poverty alleviation in developing countries. Various approaches have been suggested and implemented in various countries including Kenya. Using the data from National Small Medium Enterprises Baseline Survey 1999 and Economic Survey of 2002, 2003, 2004 and 2005 among others, this paper examines the performance of the ICT sector against national policy objectives. This study reviews the ICT sector in Kenya and its contribution to the economy. The review on which this report is based covers the whole of the ICT sector and goes up to 2007 where data was available. The purpose of the study is to assess the performance of the ICT sector and areas that need to be improved upon. ICT is used in Africa with specific limitations. Mutula (2002) identified the ICT constraints as: high cost of access to telecommunications; Government policy towards ICT; under utilisation of existing technologies; limited indigenous base; digital illiteracy. Jain (2002) established a few more in addition to the above mentioned constraints: lack of skilled and trained manpower; inadequate IT exposure in schools; lack of a National IT policy; poor communication infrastructure; ignorance of IT benefits; expensive ICT equipment and resistance to change. For example, in developing countries, usually there is a low level of internet services available. There are 4.2 million internet users in Africa (excluding South Africa) with a population of about 850 million (NUA, 2002), which indicates that 99.9 per cent people have no internet connection. However, in, 2002, 20 countries in Africa had five or more internet service providers (ISPs) while seven countries had ten or more (African Internet Connectivity, 2002). Despite these developments internet growth is constrained by poor telephone infrastructure, low international bandwidth and high-dial-up tariffs levied on internet users. Such factors severely limit internet access. FLAG (Fiber-optic Link Around the Globe) started service in 1997. It was one of the first private systems owned by an investment joint venture whose members included non telecommunication corporations. The FLAG consortium comprised six entities namely NYNEX (now Verizon), Dallah Al Baraka Group from Saudi Arabia, the Asian Investment Fund of Hong Kong, the Telecom Holding Company of Bangkok, the Marubeni Corporation in Tokyo and Gulf Associates in New York. They were backed by more than thirty international financial institutions. FLAG Telecom views itself as a global carrier’s carrier. Its target customers are the established carriers, rather than retail telecommunications consumers (Esselaar, Gillwald and Sutherland, 2007). Today, FLAG owns and operates a low-latency, global MPLS-based IP network, which is connected to most of the principal international Internet eXchanges Points (IXPs). It offers: global bandwidth, IP, Internet, Ethernet and collocation services (Esselaar et al., 2007). In the case of West Africa Submarine Cable (WASC) and Southern Africa Telecommunications cable (SAT-3) the investors were national incumbent operators in each of the countries where the cable landed, plus a group of northern hemisphere operators. The result of the exclusive control over landing rights has been little incentive on operators to increase traffic on the cable – it was estimated to operate at below one third of capacity in 2006 – rather it has been to maintain high prices and to reap the monopoly profits that result. In particular, operators have sought to avoid selling capacity at wholesale prices to operators who might resell to third parties (Esselaar et al., 2007). Some countries passed by the submarine cable were excluded from the club and thus have no spur or landing station because of the perceived lack of traffic (e.g., Guinea, Liberia, Namibia, Sierra Leone). However, the position in East Africa was much worse, with no cable landing station between Djibouti and Durban. The East Africa Submarine System (EaSSy) was planned to fill a gap in undersea cable provision and also to link up to inland projects to provide optic fibre cables to land locked countries. The initial plan, backed by the World Bank, was to have a non-club model, with open access to the cable landing stations. However, there were counter-proposals for a club system which some governments and operators considered to be commercially attractive. Unfortunately, the result has been a sequence of meetings at which little agreement has been possible (Fibre For Africa, 2006). 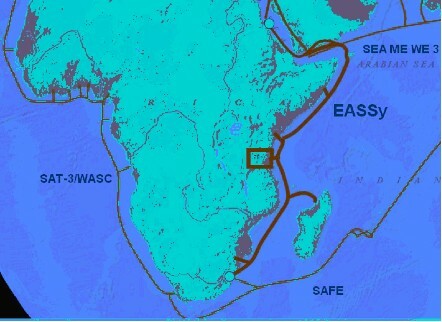 Kenya, which currently has no undersea connections, is about to have not only connections to EaSSy, but two others. By early 2009, construction is expected to be completed on The East African Marine System (TEAMS) project, a fibre link from Mombasa to Fujairah in the United Arab Emirates (UAE) in which the Kenya Government will have a 40 per cent holding. Kenya Data Networks (KDN) has entered into a contract with Flag Telecom to construct a fibre optic link that would connect Mombasa, Nairobi and Busia to a junction off the coast of Yemen. This is expected to be operational in the first quarter of 2008. An obvious concern is that with so much capacity it may be difficult for all three to recover their costs with the risks of dumping capacity below cost or bankruptcy (EaSSy, 2006). There are special cases for land-locked countries which must obtain transit through another country to reach an undersea cable. For example, Ethiopia installed a fibre optic cable to Sudan at the end of 2005, allowing connection to the cable landing station at Port Sudan, ending its dependence on satellite connections. On a larger scale, the World Bank has helped to fund a fibre optic cable network as part of a project to interconnect electricity grids in South-East Africa (World Bank Group, 2007). While competition has grown and been proven successful in internet access and in mobile telephony, the regimes for access to undersea cables have remained unreformed. It is now an obstacle to the more complete development of affordable Internet access and international telephony in Africa (Esselaar et al., 2007). The Eastern Africa Submarine Cable System (EASSy) is an initiative by the New Partnership for Africa’s Development (NEPAD) to connect Eastern African countries via a high bandwidth fibre optic cable. 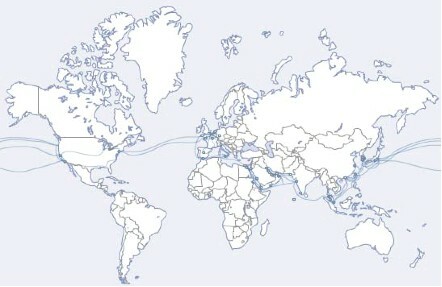 This cable would run from South Africa to Port Sudan in Sudan, with landing points in six countries along the Indian Ocean coast, and provide connectivity to at least five landlocked countries. This initiative was started in 2003 and is funded by the World Bank, Development Bank of Southern Africa and telecommunications companies in the region. In 2006, Alcatel won the tender to implement the cable system at a cost of US$300 million (KES14 billion) (RIA, 2007). As a result of the frustrations in delays in the EASSy cable, the Kenya Government started another initiative, dubbed The East African Marine System (TEAMS). It signed a memorandum of understanding with a telecommunications firm in the United Arab Emirates (Etisalat) to build two fibre pairs with an initial capacity of 10 GBps upgradable to 320 GBps. This cable will be owned by the Kenya Government (40%), Etisalat (20%) and investors in the East African region (40%). It is estimated to cost KES5.7 billion and is planned to be ready by mid 2009 (RIA, 2007). The Kenya Data Networks (KDN), one of the telecommunications service providers, signed a contract with India’s FLAG Telecom. Its undersea cable would link Mombasa at the Kenyan coast to the Yemen coast. This link is planned to be ready by the first quarter of 2008 at a cost of KES8 billion (RIA, 2007). SEACOM is largely a South African undersea fibre optic cable initiative targeted towards the 2010 World Cup to increase already available bandwidth from SAT-3 and SAFE undersea cables. It would link Cape Town along the East African coastline to Port Sudan. From here, there will be a shorter and direct link to Europe and Asia via South East Asia-Middle East-West Europe (SEA-ME-WE-4) undersea cables. SEACOM is owned by South Africans (50%), New York’s Herakles Telecom (25%) and Aga Khan Foundation for Economic Development (AKFED) (25%) through Kenyan based Industrial Promotion Services (IPS). The four initiatives represent a significant duplication of effort and are a sign of problems in implementing the oldest initiative, EASSy. The Kenya Communications Act (KCA) of 1998 established the National Communication Secretariat (NCS), headed by a Communication Secretary, whose main objective is to advise the government on the adoption of a communication policy, which, among other things is meant to encourage competition in the provision of communication services. The Communications Commission of Kenya (CCK) is an independent regulator, whose objectives are to license and regulate telecommunications, radio communication and postal services. Its vision is to “enable access to reliable communications services by all Kenyans”, while its mission is to “ensure that the communications sector contributes to the country’s overall development through efficient and enabling regulation and public participation”. Historically, it has not been clear which arm of government deals with matters relating to IT or who is responsible for the regulation of the IT sub-sector. However, the national ICT policy approved in January 2006 recognizes CCK as the regulator of the whole of the ICT sector, including IT and broadcasting. Once this is implemented through requisite changes in the Kenya Communications Act of 1998, there will be clarity on these matters and hopefully there will be increased growth in the ICT sector (RIA, 2006). The national broadcaster (Kenya Broadcasting Corporation), with the highest penetration of radio and TV coverage, has 95% of the population covered by radio and 65% covered by television. At the same time, an estimated 87.2% of households have a radio set and 17.1% a television set (RIA, 2007). Mobile telephony was first introduced in Kenya in 1992, and the technology has moved from the initial External Total Access Communications Systems (ETACS) to the second and third generation of Global System for Mobile communications (GSM) (RIA, 2006). Celtel Limited, a joint venture with Celtel International and Vivendi Telecom International (RIA, 2006). Safaricom was Kenya’s first GSM operator and began offering services in 1997. Subscriber growth, however, did not take off until 2000 when a competing GSM operator was licensed and Vodafone invested in network expansion. Kencell, the predecessor of Celtel, was the first licensed mobile operator and became the second GSM operator in January 2000. Even with this limited liberalisation in the mobile market, the impact has been far-reaching, especially with respect to mobile penetration (RIA, 2006). Table 1 shows the performance of the two operators in this market. The 2004/2005 tariffs (in KSh) for the three main telecommunications operators are shown in Tables 2 and 3. The current conversion rate is 1US$ = 72 KSh. The Kenyan ICT policy remained in draft form for several years, largely because of a disjointed institutional framework for policy development, lack of a high-level ICT champion in government and lack of adequate and sustainable funding for ICT (Waema, 2005). Things began to move however after the Ministry of Information and Communications was created in mid-2004. This Ministry facilitated and led the organization of the first truly stakeholder-driven national ICT workshop held over a three day period (in June 2005). At the end of this workshop, a small group of participants was appointed to use the inputs from the stakeholders to create the final draft ICT policy. By August 2005, the Ministry of Information and Communications had prepared a cabinet memorandum on the draft ICT policy. This policy was discussed and approved by the cabinet in January 2006 and an ICT policy document published in March 2006. For the first time in more than two decades of failed attempts, Kenya had an official ICT policy (RIA, 2007). It was anticipated that the new policy would quickly be followed by an ICT master plan to implement the policy. However, just like the processes of developing the policy were long and drawn out, interviews with persons involved in creating the project to draw up implementation plans indicate that the process is going to take a long time. The main reasons for this are that the Ministry of Information and Communications does not have adequate capacity to lead the process, lacks funding and a committed champion, and the interests of the key stakeholders have started to become apparent, much like at the time of development of the ICT policy itself. For example, several private sector organizations have positioned themselves to influence the nature of the implementation plans to serve their own interests (RIA, 2007). A number of local institutions and groups have come to exert a significant influence on ICT policy and regulation. The more notable ones include the Telecommunications Services Providers Organization of Kenya (TESPOK), Kenya ICT Federation (KIF) and Kenya ICT Policy Action Network (KICTANET). TESPOK represents the telecommunications service providers in Kenya. For example, TESPOK lobbied government regarding the establishment of the Kenya Internet exchange Point (KIXP) and the liberalisation of very small aperture terminals (VSATs). It also encouraged the government to establish the Ministry of Information and Communications and helped to set up Internet exchange points in other regional countries (RIA, 2007). KIF is the umbrella body which brings together all private sector organizations with an interest in ICT. TESPOK and the Computer Society of Kenya are members of KIF, which vigorously lobbied the finalization of Kenya’s ICT Policy. KICTANET is a recently formed civil society organization that is a loose network of donors and NGOs. It collected comments from various parts of civil society in Kenya regarding the ICT policy and forwarded them to the Ministry of Information and Communication (MOIC). In general, three bodies, representing private sector, civil society and donors played a significant role in the development of the national ICT policy and also influenced regulatory reform (RIA, 2007). Without a legal and regulatory framework ICT cannot fully take off. Hence, all the countries need to address this seriously and some of them have already started working on it. The Global Internet Policy Initiative (GIPI) organised a seminar in mid-2003 where the various benefits of legal and regulatory framework were documented at length. Nations around the worlds have moved from “benign neglect” of the internet to legislative and regulatory interest in promoting ICT development. By investing in modern technology and applying ICT tools to deliver services, India, for example, has given new impetus to economic growth. Some of the recommendations GIPI (2003) made were: for an open internet, necessity to work locally and develop consensus among stakeholders at the national level about the laws and regulations. What framework is required for the internet and ICT to flourish? All the regulatory and legislative process should be transparent, accessible by all the nationals and implemented without discrimination. Local barriers to ICT development and opportunities for reform should be considered. ISPs should have access to network facilities on the same terms Telecom provides their own ISP affiliates. Goods and services should be opened to foreign competition and there should be low trade barriers. Industries, governments and NGOs should encourage the creation of local language websites. Support should be given to the development of standards for browsers and other software that display local alphabets. Intellectual property should be protected adequately and in order to give profit to knowledge holders (Jain, 2006). Despite the vast amounts of literature devoted to the topic of this study, little is known about the precise causes of the great advances that have occurred in the field of ICT. At times, it seems that the evidence contradicts what theoretically must be happening, and this may be in part due to faulty regulatory infrastructures and policies. Regulatory infrastructures and policies rarely benefit from public interest, and because of this they do little to assist these developments. It is because Africa hardly produces its own policies and regulatory frameworks, African countries just adopt from the developed world. That does not fit in African context. More research is vital to base legal framework to address country-specific problems (Jain, 2006). The initiatives have already been taken by Research ICT Africa (RIA) (2004). This network seeks to fulfill a strategic gap in the development of a sustainable information society and knowledge economy on the African continent by building information communication technology (ICT) policy and regulatory research capacity in Africa needed to inform effective governance. It will generate the information and analysis needed to inform appropriate but visionary policy formulation and effective regulation of ICTs across Africa. It will embark on sustained and rigorous research to provide decision-makers with the data and analysis to make informed decisions in the public interest (RIA, 2004). Although efforts are being made in this direction, a lot still needs to be done in terms of adequate legal and regulatory framework in Africa, if Africa wants to use ICT as an empowering tool for its development. The Kenya Communications Act (No. 2 of 1998) provides the framework for regulating the communications sector in Kenya. Enacted by Parliament in 1998, the Act was a deliberate attempt by parliament to give legislative teeth to the Postal and Telecommunications Sector Policy Statement, which had been issued by the then Ministry of Transport and Communications in January 1997 and updated in 1999 and 2001. The said Act is clarified and expounded in the Kenya Communications Regulations 2001 (RIA, 2007). The most influential document regarding ICT legislation and regulation in Kenya is the 1998 Kenya Communications Act (KCA). The KCA, which repealed the Kenya Posts and Telecommunications Act, provides the current framework for regulating the communications sector in Kenya. The Act unbundled Kenya Post and Telecommunication into five separate entities including Telkom, the fixed line operator; the Postal Corporation of Kenya (Posta); the regulator, the Communications Commission of Kenya (CCK) as the sector regulator; and the National Communications Secretariat (NCS) to advise the government on the adoption of a communication policy. It also created an Appeals Tribunal for the purposes of arbitration in cases where disputes arise between parties under the KCA (RIA, 2007). As part of the post-exclusivity regulatory strategy, CCK issued a statement in September 2004 containing a new licensing framework. The general goal of this framework was “to ensure that the regulatory environment in the sector is friendly to investment and conducive to the provision of modern communication services” (Waema, 2004). The specific objectives of the new licensing framework were to ensure that Kenya has a more dynamic and competitive ICT environment, improved access to ICT infrastructure and services and choice in the provision of communication services to meet socio-economic needs of the society. develop an institutional framework for policy development, implementation and review. The SME sector has an important role to play in the present and future economic development, poverty reduction and employment creation in developing economies (Hallberg, 2000). Stern (2002) stresses that the SME sector is the sector in which most of the world's poor people work. SME sector growth largely exceeds the average economic growth of national economies in many countries and contributes significantly to employment creation. Accordingly, governments and donors alike have recognised the important role of the SME sector for overall development. As a result, many government policies are geared towards supporting their growth through a variety of programmes that range from tax incentives to technical assistance; from regulatory provisions to policy interventions; training and other types of business development services (O'Shea & Stevens, 1998). Arising from this, one of the key issues is to identify the current information practices and needs, as well as the obstacles that SMEs face in their daily business activities, and to provide guidance in creating relevant policy initiatives that will lead to more economic growth and employment. The establishment of the link between ICTs and profitability and labour productivity creates another set of policy imperatives for governments across the continent. ICTs are only useful if they can easily be acquired and used. The key obstacle identified by SMEs towards greater possession and use of ICTs is their cost. The high cost of ICTs in Africa has been attributed to policy choices that have limited competition, and the absence of regulatory capacity to regulate abuse of market dominance in wholesale and retail pricing (Gillwald, 2005 and Gillwald & Esselaar, 2004). This requires greater regulatory capacity, something that is missing from nearly all countries. To illustrate this, most governments are exclusively focused on the direct contribution of ICTs towards the economy in terms of profits and staff complements of major telecommunications operators. However, as this report makes clear, it is the indirect contribution of ICTs towards economic growth that is truly transformative: “ICTs have the largest beneficial impact in conjunction with other changes, including a new set of ICT skills/training, structural changes within business models and the economy, and institutional and regulatory adjustments” (ITU, 2006). This means that ICTs have to be looked at from a perspective that considers all causes of economic growth and attempts to provide a catalytic environment that uses ICTs to generate economic growth rather than the ICT sector's specific contribution towards GDP. The Sessional Paper No. 2 of 2005 defines the Small and Medium Enterprises (SMEs), which it refers to as Micro and Small Enterprises (MSEs) as all enterprises, both farming and non-farming, employing less than 50 persons. The annual economic surveys refer to the SME sector as the “informal” sector. The last SME baseline survey was carried out in Kenya in 1999. There are about 1.3 million micro and small enterprises in Kenya employing some 2.4 million people. Almost two-thirds of all SMEs are located in the rural areas. About 17% are found in Nairobi and Mombasa. Table 4 shows the location of these enterprises in the different strata to which the country has been divided. Nairobi and Mombasa account for 9.7% of the national population. Out of the total 1,289,012 SMEs in the country, Nairobi and Mombasa account for 204,280 of them; this is 15.8%. Compared to their population, Nairobi and Mombasa have a relatively high number of SMEs. Likewise, the rural areas contain over 80% of the total population and 65.6% of the SMEs. Thus, compared with the other strata, the major urban areas have a higher density of SMEs per given population. The average number of people working in each enterprise is 1.8. In Nairobi and Mombasa, the average is 2.0, and in the rural towns, it is 1.6 (National MSE Baseline Survey, 1999). Table 5 shows the percentage distribution of SMEs of different employment sizes. Nationally, about 70% of the SMEs are one person units, whether in the major urban towns or in the rural areas. The size distribution of SMEs among the different strata is very similar, except for rural SMEs in the 6-10 size group which is a higher proportion than the other strata. As already indicated, the average size of SMEs is about 1.8 regular employees. However, there are no SMEs in the size ranges above 15 people either in the small towns or in rural areas. Similarly, all the enterprises that employ more than 25 people are found in Nairobi and Mombasa (NSMEBS, 1999). Although a new baseline study is long overdue, comparing results of earlier baseline surveys from 1993 and 1995 with the baseline study of 1999 shows that the sector had experienced growth. The distribution of persons engaged in SME sector activities by industry is given in Table 6 for 2000 to 2004. The wholesale and retail trade, hotels and restaurants industries accounted for the largest number of jobs, comprising about 58% of the total jobs. The manufacturing industry is second, accounting for an average of 22% of the total jobs in this sector. The two accounted for an average of about 80% of the jobs generated in the sector over the years (NSMEBS, 1999). The contribution of SMEs to both employment creation and to GDP is shown in Table 7. It shows that the SME sector has consistently contributed over 400,000 annually and contributes over 70% of the total employment in Kenya (with the last two years being over 75%). Although most figures are not available, the SME sector has a significant contribution to GDP (18.4% in 2002) (RIA, 2006). According to the Sessional Paper No. 2 of 2005, the overall goal of the Kenya SME policy framework is to develop a vibrant SME sector capable of promoting the creation of durable, decent and productive employment opportunities, stimulating economic growth, reducing economic disparities, strengthening linkages between firms, diversifying the domestic production structure and industrial base, leveling the playing field between SMEs and the larger enterprises, improving the SME sector funding and enhancing institutional collaboration and coordination of interventions in the sector (RIA, 2006). Source: Economic Survey 2002, 2003 and 2004. African Internet Connectivity (2002). The Current Status of the Internet in Africa, [Online] Available: www.3.sn.apc.org/africa/afstat.html (accessed 14 December 2003). Arora, R. (2002). Implementing a balanced score card approach, Journal of Knowledge Management, Vol. 6 No.3, pp.240-9. Bhatt, G.D. (2001). Knowledge management in organizations: examining the interaction between technologies, techniques, and people, Journal of Knowledge Management, Vol. 5 No.1, pp.58-68. Claessens, S. Glaessner, T., & Klingebiel, D. (2002). Electronic Finance: Reshaping the Financial Landscape around the World. World Bank. [Online] Available at www.worldbank.org . Clarke, T. (2001). The knowledge economy, Education + Training, Vol. 43 No.4/5, pp.189-96. Drucker, P. (1993). Post Capitalist Society, Harper Row, New York, NY. Enderwick, P. (2002). Global Management and Future Organisations, International Graduate School of Management, University of South Australia, Adelaide. Gillwald, A., & Esselaar, S. (2004): South African ICT Sector Performance Review. Wits University School of Public and Development Management, Johannesburg. GOVK (2002): Economic Survey 2002. Central Bureau of Statistics, Nairobi, Kenya. GOVK (2003): Economic Survey 2003. Central Bureau of Statistics, Nairobi, Kenya. GOVK (2004): Economic Survey 2004. Central Bureau of Statistics, Nairobi, Kenya. GOVK (2005): Sessional Paper No. 2 of 2005 on Development of Micro and Small Enterprises for Wealth and Employment Creation for Poverty Reduction, Government Printer, Nairobi, Kenya. GOVK (2006): Republic of, National Information & Communications Technology (ICT) Policy, January 2006, Ministry of Information & Communications, Kenya. Hallberg, K. (2000). A Market-Oriented Strategy for Small and Medium Enterprises, in IFC Discussion Paper no. 40, The World Bank, Washington DC. Halsey, W.D. (Ed.) (1986). Collier's Dictionary, Macmillan Publishing, London. International Telecommunication Union (2004). African telecommunications indicators, ITU, Geneva. ITU (2006). World Telecommunications Development Report, International Telecommunications Union, Place des Nations: Geneva. IMAC Community Documentation of Indigenous Knowledge (2001). [Online] Available: www.imacmexico.org/ev_es.php?ID=5459_201&ID2=DO_TOPIC. Lang, J.C. (2001). Managerial concerns in knowledge management, Journal of Management, Vol. 5 No.1, pp.43-57. Leonard, D., & Sensiper, S. (1998). The role of tacit knowledge in group innovation, California Management Review, Vol. 40 No.3, pp.112-32. Meso, P., Smith, R. (2000). A resource-based view of organizational knowledge management systems, Journal of Knowledge Management, Vol. 4 No.3, pp.224-34. Mutula, S. (2003). The digital divide in Sub-Saharan Africa: implications for the revitalisation and preservation of indigenous knowledge systems, paper presented at the SCECSAL – 15 Conference, 15-19 April 2002, Johannesburg. Ngubane, B. (2003). Address by Dr Ben Ngubane, Minister of Arts, Culture, Science & Technology, Molopo Lodge, South Africa. [Online] Available at: www.dst.gov.za/news/speeches/minister/benefit_sharing_san.htm. Nicholas, D., & Rowlands, I. (2000). Aslib/IMI, London. O'Brien, A.J. (1993). Management Information Systems: A Managerial End User Perspective, 2nd ed., Irwin, Burr Ridge, IL. O'Shea, M. & Stevens C. (1998). Governments as Venture Capitalists, in The OECD Observer. OECD (1996). The Knowledge-based Economy, OECD, Paris, pp.14. Prytherch, R. (2000). Harrod's Librarians' Glossary & Reference Book, 9th Ed., Gower, London. Roy, L., & Raitt, D. (2003). The impact of IT on indigenous peoples, The Electronic Library, Vol. 21 No.5, pp.411-13. Saunders, C., & Gebelt, M. (1997). Achieving success in information systems outsourcing, California Management Review, Vol. 39 No.2, pp.63-77. Skyrme, D.J. (2001). From Information Management to Knowledge Management: Are You Prepared?, [Online] Available at: www.skyrme.com/pubs/on97full.htm. Smith, A.D.,& Rupp, W.T. (2002). Communication and loyalty among knowledge workers: a resource of the firm theory view, Journal of Knowledge Management, Vol. 6 No.3, pp.250-61. Stern, N. (2002): A strategy for development, The Worldbank, Washington DC. Stork, C., Esselaar, S., Ndiwalana, A., & Tusubira, F. (2006). Information and Communication Technologies in Small and Medium Enterprises: Findings from Uganda. Submitted to Makerere University Journal of ICT for Development. Waema TM (2004). Final Report for the Universal Access to Communication Services: Development of a Strategic Plan and Implementation Guidelines. Nairobi. Communications Commission of Kenya. Willcocks, L., & Choi, C.J. (1995). Co-operative partnership and total IT outsourcing: from contractual obligation to strategic alliance, European Management Journal, Vol. 13 No.1, pp.67-78. World Bank Group (2003). [Online] Available at: www.worldbank.org/afr/ik/. World Bank Group (2007). Regional Communications Infrastructure Program Resettlement Policy Framework. Yahya, S., & Goh, W-K. (2002). Managing human resources toward achieving knowledge management, Journal of Knowledge Management, Vol. 5 No.5, pp.457-68.